Futaba FRN-0602U | LOR Manufacturing Company, Inc. The Futaba FRN-0602U 6-channel radio remote control system offers exceptional value in a small industrial remote control. With microprocessor control in both transmitter and receiver, the unit provides remote control of up to 6 relays. Application possibilities include conveyors, hoppers, stop light systems, construction machinery, boom trucks and much more. Exclusive direct sequence data encoding techniques provide a system with excellent reliability and immunity to false activations from noise and interference. Additionally, 16-bit system identification codes offer excellent security. Housed in an injection molded high impact plastic case with water resistant gaskets, the transmitter's sealed membrane switches assure long life in an industrial environment. 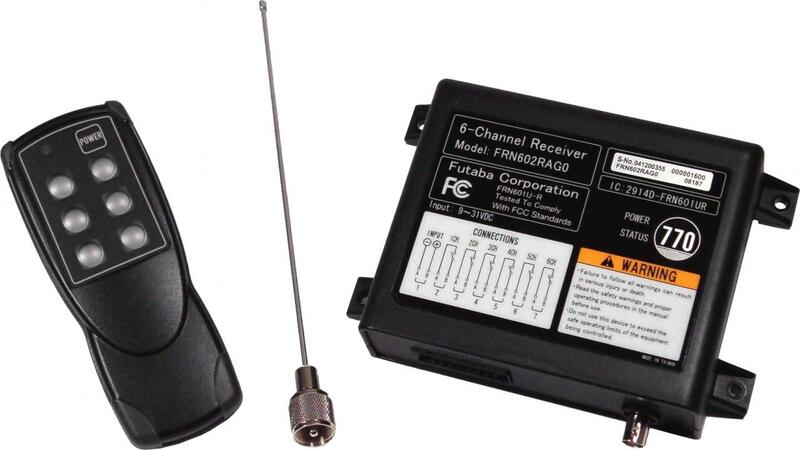 The receiver, also in an injection molded high im pact case, operates on 12 or 24 VDC power. Momentary dry pair outputs are standard, with optional latching outputs and switched source voltage contacts available.